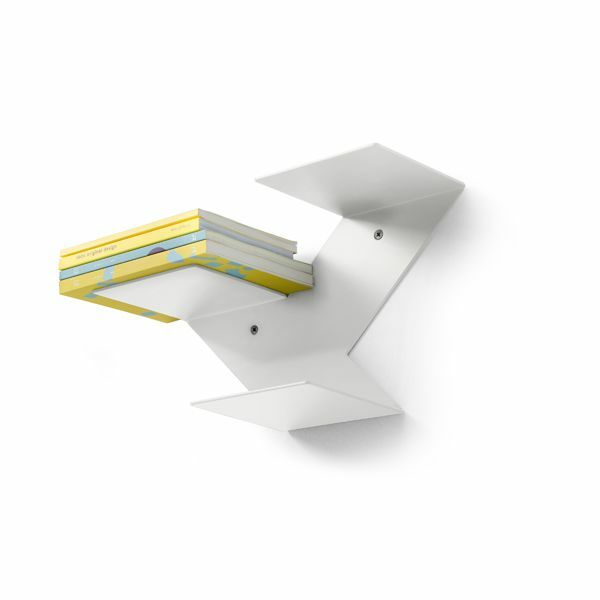 Fin is a painted steel modular shelf, for wall mounting, that brings to mind the fin of a dolphin and is sold in pairs with its twin. With minimal visual impact, it projects from the wall to provide a surface for books, turning them into furnishing objects, allowing new gravity-defying compositions to take shape that float across the walls. With Fin, the German designers Neuland Paster & Geldmacher overturn the classical arrangement of volumes and propose a new modular concept for the walls of booklovers keen on design. Eva Paster and Michael Geldmacher met while studying at the University of Applied Sciences in Munich; in 1999 they opened their studio “Neuland Industriedesign” in the Bavarian capital. Until 2005 Eva and Michael dedicated themselves to classical industrial design (medical technology, products for the outdoors, games and cosmetics). Since 2005 they have started designing furnishing items for international clients, receiving several prizes for their works, among which the 2006 Elle Deco Design award, a nomination for the 2007 Compasso D’Oro, the Chicago Good Design award, the IF Product Design Award and a nomination for the German Federal Republic Design Award.